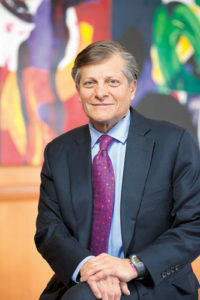 “The relatively amazing thing is that if you eat in the morning and at lunch, you’re not hungry at what you would consider normal dinnertime,” marvels Roizen, who estimates he used to down 70 to 75 percent of his daily calories between 7:30 p.m. and 9 p.m. 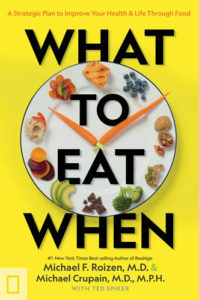 In his latest book, What to Eat When [National Geographic Books, $28], Roizen—who wrote the bestselling You series of books with syndicated health-and-wellness TV-show host Dr. Mehmet Oz—and co-author Dr. Michael Crupain also suggest what to eat in certain situations. When you’re stressed and “hangry.” Avoid the crash that inevitably follows a simple-sugar high—keep a snack on hand that provides the fiber, protein and healthy fat needed to alleviate hunger and satisfy the urge to munch (raw veggies and hummus, for example). Roizen’s favorite is roasted chickpeas, made by rolling the legumes in paper towels to dry them; spreading them evenly on a baking sheet; sprinkling them with a little extra-virgin olive oil; and roasting them in a 425-degree oven for 30 to 40 minutes, shaking the sheet every 10 minutes. Roizen likes to season his with garlic, rosemary and cayenne before roasting. When you’re fighting fatigue. The first thing to grab is a half-gallon thermos of water to sip throughout the day. Roizen explains that when the body is short of water, it releases hormones that cut blood flow first to the skin, then to the muscles. When you can’t sleep. Eating fish regularly has been linked to helping prevent poor sleep. According to Roizen, the benefit is assumed to be derived from tryptophan, that amino acid blamed for inducing naps after a Thanksgiving turkey dinner. A side of leafy greens such as spinach contains magnesium, which seems to relax muscles. And tart cherry juice has been shown to be a boon to bedtime, perhaps by increasing levels of the body-clock-regulating hormone melatonin. When you’re sick. Roizen notes studies have found that long-touted home remedy, chicken soup, actually has an anti-inflammatory effect, although “no one’s isolated the active component, to my knowledge.” Ginger, he adds, “interferes with the attachment of the virus to the cell membrane”—good enough reason to sip a cup of ginger tea.